"When the nights become longer, the days shorter and the water gets colder - then the time for Dry Suit Diving has come." If you want to dive during the fall and winter in the colder climates, DRY SUIT DIVING is the course you should take. Visibility at these times of the year is usually excellent so it's a great time to get out there. f you want to learn more about DRY SUIT DIVING, you can buy the manual or the DVD even if you don't want to sign up for the course. 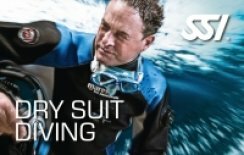 Did you know: Combine other specialties while taking the DRY SUIT DIVING course! EQUIPMENT TECHNIQUES or WRECK DIVING are great add ons. The possibilities are limitless!